Now that it’s published on gayswithkids.com I can share my latest article. For the published article (and to see the video) please visit https://gayswithkids.com/frightening-symptoms-little-sons-mysterious-disease/ It all started last summer. We’d had a perfect family summer holiday in Hunstanton, Norfolk. A beach from my childhood, a trip down memory lane and a great catch up with my big sister Lorraine. 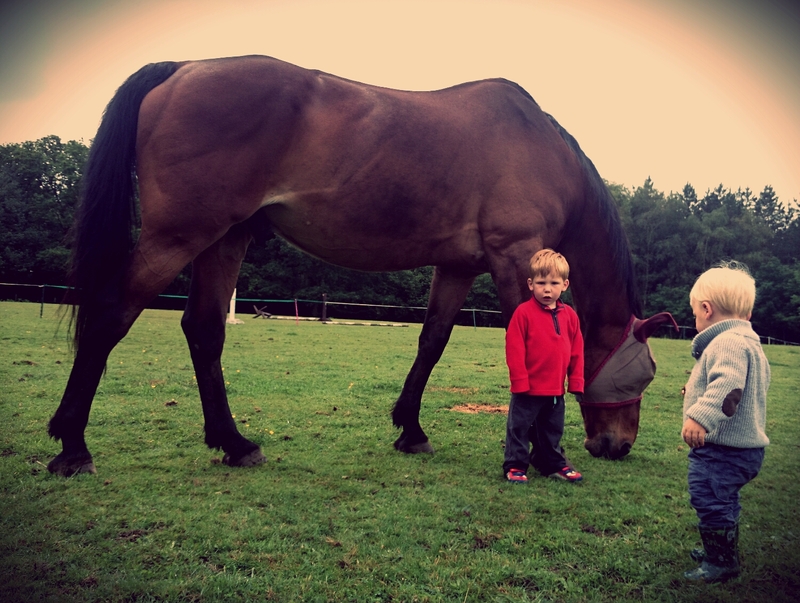 Such a great holiday; little were we to know it would be a prelude to our son Louis getting ill. We got back home from holiday and a week or so later were seeing to our horses with all of our children; Wil (5), Louis (3) and Connor (2). Out of nowhere Louis started to fall over. He was giggling maniacally when he did it – so much so that I got cross with him thinking he was fooling around. It really looked like he was just mucking about. His legs would buckle and spasm and he would fall to the floor. When he did manage to drag himself up he would stagger around like a drunkard before falling to the floor again, all the time smiling It was only after a few sharp words and a near miss with some barbed wire and the water trough didn’t stop him that I started to worry. We picked him up time and time again, but he kept falling down. It just didn’t seem to bother him that much. I took a video – just in case we needed to show it to anyone, it was so odd. Louis picked up a bit when we got home and after he’d had a bit of a sleep. When he got up he was still a bit wobbly and didn’t seem himself, but not wanting to worry unduly we decided to wait, watch and see. Still worried I posted the video online to see if anyone had experienced anything similar. Now when I look back at the video I’m cross that we didn’t do something sooner – it seems so much worse than I remember – we were just so undecided on what to do for the best. We had loads of responses to the clip. The most common thought was an inner ear condition. I wasn’t so sure. The next morning Louis was a bit better, but still wobbly and not quite right. I received a message from a friend who is a nurse. The friend had kindly shown the clip to a paediatric Dr who said to get Louis into hospital immediately. I rang my husband Ivan in tears. Why hadn’t we taken him straight in? What if our delay had made things worse? I was so scared. We took Louis straight to the emergency department without delay. The Dr there was clearly concerned and he was admitted straight away to the children’s ward for investigation. By this stage Louis couldn’t walk in a straight line. His speech was slurred and he was starting to drool. His right eye was wandering and his fine motor skill was off. We were terrified. We couldn’t lose him, but it felt like that was a very real possibility. The Dr’s explained that the wobbling that Louis was suffering from was called Ataxia and that it could be caused by a number of things. The most obvious being a brain tumour. Louis was rushed in for a brain scan while we waited nervously. Thankfully the results came back clear. The following week saw Louis having test after test. He had a lumbar puncture to check for meningitis and related conditions – all came back clear. He had numerous blood tests to check for various conditions and illnesses, all of which came back clear. They put Louis on IV antibiotics and anti-virals as a precaution. He has been left with an intense fear of needles. Slowly Louis’ symptoms stabilised. He wasn’t the same as he was before, but he wasn’t displaying the same dramatic symptoms that he was when he was admitted to hospital. His walking was steadier and his eye had settled. His speech continued to be slurred and his gross motor skills were off. It’s hard to put into words but, whilst he was still the Louis that we love beyond words, he was a shell of the boy he was prior to the incident that hospitalised him. I mean he played and giggled like he did before, but there was a delay and a vacancy that wasn’t there before. We felt utterly helpless. As his parents we wanted to be able to kiss it all better as you would a scuffed knee. It just wasn’t possible. It felt like we were failing him. After a week or so of tests, all immediately life threatening conditions were ruled out. It was a big relief. But we still had no answers. However, they let him home. It was great to be back too. The family back together as it should be. We’d each kept a vigil at hospital. One with Louis and the other taking it in turns to spend time with our other kids who were staying with family. Having Louis home we managed to get back to some sort of normality. We had a long journey ahead of us however. All of the obvious things had been ruled out, but we still desperately needed to find out what was going on. Louis was referred to a top paediatric neurologist who repeated all of the tests and carried out more. We now know plenty of what isn’t wrong with Louis and so are hopefully narrowing down what it might be. It’s coming up to 8 months of investigation now. At present we’re waiting for the results of various genetic tests that they are carrying out to see whether they reap any results. As Louis is adopted it makes things a little bit more complicated. We have a rough family medical history, but it’s not as involved as we’d like it to be. Both birth dad and birth mum were asked for consent to check their medical records. His birth Dad has agreed, but birth Mum hasn’t. The tests they are currently doing are for some pretty horrible things. Things we don’t really want to consider, but have to. Most of these are degenerative conditions that just seem so unfair. Some of them aren’t however. Sure, they’re still serious, but not deadly. Whatever happens we’ll get by day to day as we always do. Louis has clearly gone backward from where he was prior to the incident in the summer. He’s still our gorgeous little man with the cheeky smile, the glint in his eye and the oh so fiery temper! He goes to pre-school now and his vocabulary is expanding and he’s a bright little lad. Daily though we deal with his wobbles. Some days minor, others he can’t stand or walk more than a few feet without falling and he’s always banging into things. His speech is slurred and he drools on and off. It wrenches my heart when I see him struggling to stab his food with his fork due to his wavering fine motor skills, but we let him keep trying to maintain his independence. There are days where he’s so alert and bright that you can’t imagine there’s anything the matter. Then there are others where he’s dull and vacant, a shell. There’s no obvious pattern to any of it. We’re lucky to have some great support – not just family and friends who were their usual amazing selves – but the medical professionals who have been really amazing. They’ve assessed him and supplied equipment to help. We’re in talks with the best way to transition him to school and the Dr’s continue to strive to find us a diagnosis. In the meantime we’ll stay strong as a family. We’ll deal with the ups and downs and carry on regardless, as is the only way. We’ll continue to hope and pray for a positive outcome. He is and always will be our ginger ninja. He is the lad who never lets it bother him and just picks himself up time and again. We’ve learnt a lot from him. We have learnt a lot about us. If we had any doubts, it’s proven that we are family. We are strong. Together we’ll deal with whatever comes our way. We love you Louis. Wobbles and all.